Cynomolgus CD3 delta, His Tag (CDD-C52H8) is expressed from human 293 cells (HEK293). It contains AA Phe 22 - Ala 105 (Accession # Q95LI8). The protein has a calculated MW of 14.3 kDa. The protein migrates as 26-42 kDa under reducing (R) condition (SDS-PAGE) due to glycosylation. Cynomolgus CD3 delta, His Tag on SDS-PAGE under reducing (R) condition. The gel was stained overnight with Coomassie Blue. The purity of the protein is greater than 90%. 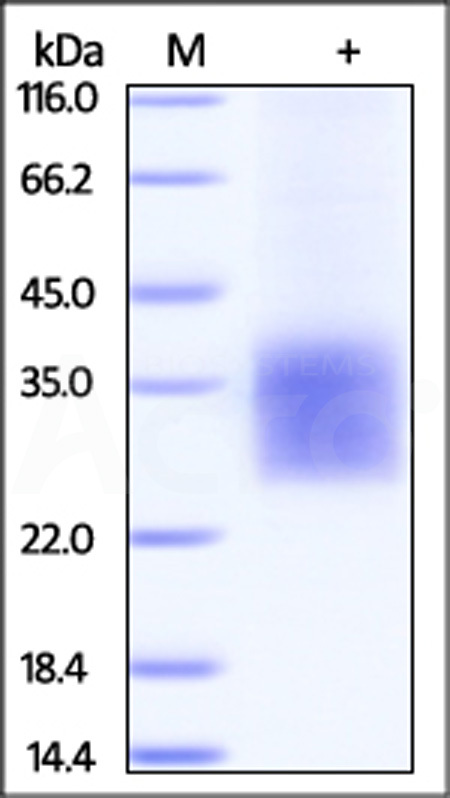 CD3D is also known as CD3-DELTA, T3D, and is a single-pass type I membrane protein. CD3D is part of the T-cell receptor/CD3 complex (TCR/CD3 complex) and is involved in T-cell development and signal transduction. The encoded membrane protein represents the delta subunit of the CD3 complex, and along with four other CD3 subunits, binds either TCR alpha/beta or TCR gamma/delta to form the TCR/CD3 complex on the surface of T-cells. Defects in this gene are a cause of severe combined immunodeficiency autosomal recessive T-cell-negative/B-cell-positive/NK-cell-positive (SCIDBNK). Two transcript variants encoding different isoforms have been found for this gene. Other variants may also exist, but the full-length natures of their transcripts has yet to be defined. Defects in CD3D cause severe combined immunodeficiency autosomal recessive T-cell-negative/B-cell-positive/NK-cell-positive (T-/B+/NK+ SCID) which is a genetically and clinically heterogeneous group of rare congenital disorders characterized by impairment of both humoral and cell-mediated immunity, leukopenia, and low or absent antibody levels. (1) Gil J, et al., 2011, J Clin Invest, 121(10):3872-6. (2) Lu X, et al.,2011, Hematology, 16(3):185-9. (3) Kim ST, et al., 2010, J Immunol, 185(5):2951-9.